Wait! Bebop and Rocksteady as Heroes?! 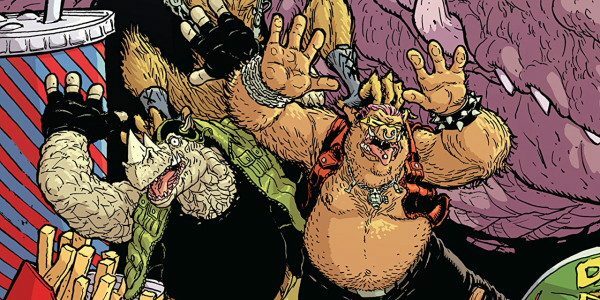 Bebop and Rocksteady are heading back to New York but not before they get into a little trouble first. It’s all going on for unlikely heroes firstly they seem to be turning human again or partly anyway and now they are questioning their whole way of life, they really just wanna be loved. Luckily for them, they get the chance to do a good deed and help “Razzmatazz” hunt down a creature of legend. 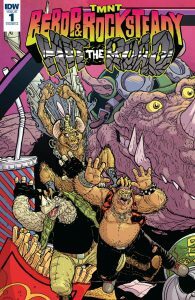 I love the look of this comic it really fits in with Bebop and Rocksteady ethos it’s really grungy and a little manic looking it goes so well with the craziness these two seem to exude and gives it a really dark edge to it. Overall this is just a brilliant OTT road trip for two clueless mates to blunder their way from disaster to disaster but it makes a brilliant comic and I can’t wait to see what happens when Special Agent Ravenwood catches up with them.